Yesterday, State House Kenya sent out a statement about plans for a new Kenya oil pipeline from Lokichar in Turkana to Lamu at the Kenya Coast which Total had now committed to build. The statement comes at a time when Uganda which is believed to have larger oil fields that Kenya has committed to build an oil pipeline through Tanzania, rather than through Kenya. Also for Kenya which had planned to start oil shipments last year in a pilot project using trucks from Turkana to Mombasa, with Tullow, had that plan temporarily stall over infrastructure and political issues. Blocks sweeten oil pipeline deal. The Total offer will be sweetened by the provision of some oil blocks in Kenya. Total is in the processor completing an acquisition of Maersk Oil for $7.45 billion and doing the pipeline for Kenya is one way to get local approval for the deal from the local competition authority. 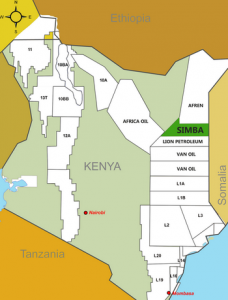 Following Total SA’s commitment, the Government has consented to a proposed acquisition of the issued and to-be-issued share capital of Maersk Oil Exploration International (Mogas Kenya) in respect of Blocks 10BA, 10BB and 13T. – State House Kenya statement. Total Kenya is listed on the Nairobi Securities Exchange and Total has been in Kenyan for over sixty years; the company’s operations include eight depots (five of which are solely owned), 2 LPG filling plants and 180 service stations. The news comes after other oil developments including Total buying out a majority of Tullow’s oil developments in Uganda, leaving Tullow to concentrate on the oil pipeline through Tanzania. 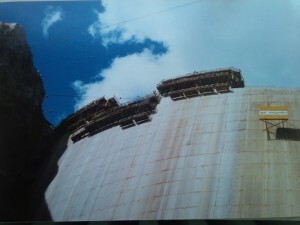 Also see part I of Oil Pipeline, Economics & Politics. This entry was posted in Kenya economic growth, Lamu, LAPSSET, oil industry, Total, Turkana on January 25, 2018 by bankelele. Kenya is currently the largest market for solar home systems on the African continent and second largest in the world, after China, by both annual sales as well as total installed base. The Kenyan solar home system (SHS) category is considered the most competitive by far, and due to its history and heritage, one of the most developed, albeit primarily in the informal sector. Today, there are over 350,000 solar home systems across Kenya and the market is still growing at more than 15% a year. Choice: With so much to choose from and new products, services, and business models being launched, how can you evaluate what kind of solution would work best for your household needs? Not only is there something for every budget but big names such as Safaricom, Total, Dayliff (Davis & Shirtliff), Sollatek and the IFC with its “Lighting Africa” initiative, all have something to offer. Do you go with the brand that is backing the product or do you evaluate the category of product and its suitability for your home? 1. 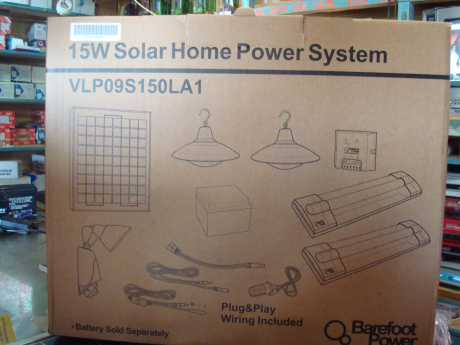 “SHS in a box” or “Lighting kit in box”: Today, complete kits like the one shown below are available in certain electrical shops around the country. This particular one, sells for somewhere around Kshs 15,000 (~$175) and includes a motion sensor security light as well all the components required for installation. 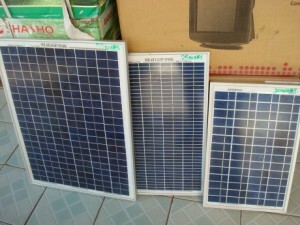 They are available in three main sizes – small, medium and large – but keep in mind that since brands like these are social enterprises, they are aimed at the lower income demographic – and the 15W kit shown above is the ‘Large’ size but is limited to providing only lights, and will not be able to power a television set or a stereo system. Note also that the battery is not included. Depending on the brand, expect to pay around Kshs 4000 to 6000 extra. An alternate type of kit is the Phillips one shown below, meant for middle-class urban homes as a backup for electricity power cuts. Available at selected Nakumatt supermarkets for Kshs 6,000 ($70), this is one of the most expensive backup solar light kits in the market, however, the elegant design and details such as a wall mounted light switch make it an attractive option for the upwardly mobile home. The advantage of this type of complete kit is that all the components are ostensibly designed to work seamlessly together and everything necessary to the system up and running is available in one box. This approach addresses one of the biggest challenges with SHS in Kenya which is the dearth of well-trained fundis (technicians/installers/repairmen) with the experience and knowledge of designing a solar home system. The disadvantage of such a system, however, is that it is limited to the components provided, in that one cannot simply add on and build a larger system. Some of the best-provided homes in off-grid rural locales have extensive installations built up over time to power their entire homestead and numerous electrical appliances – so when choosing what kind of system to purchase, keep your future needs in mind. 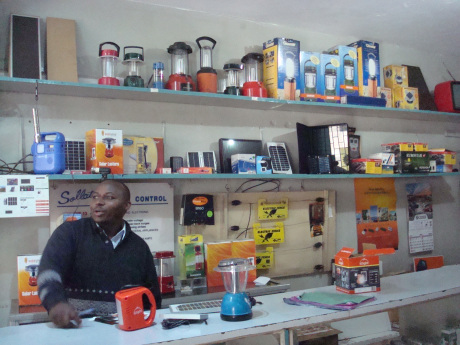 Due to donor-funded support from institutions such as the IFC, whose Lighting Africa initiative offers market research information as well as quality audits on products, the Kenyan market is flooded with a large variety of solar lanterns, both with the ability to charge your mobile phone and without. 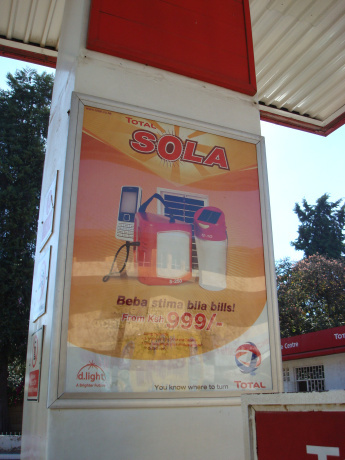 Total, for example, distributes d.Light’s solar lanterns at its retail petrol stations, while Nakumatt picks and chooses which products it will carry according to the needs of the location their outlets serve. 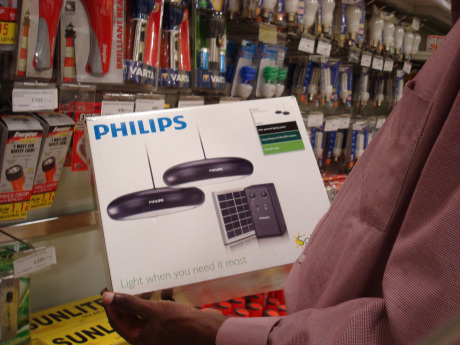 The basic light sold at Total costs Kshs. 999 ($12) while the larger model which allows you to charge your mobile phone as well can go for upwards of Kshs. 3,000. 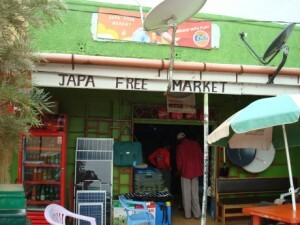 Given the wide variety and choice available in the Nairobi market, one can choose according to design and price as per one’s preference. However, these solar solutions are limited to a single light and the vast majority of products tend to have the panel either embedded in the light source or attached to it permanently, limiting their flexibility. Powerpoint’s outlet in Twiga Towers is one of the few reputable solar specialists specializing in serving the needs of urban Nairobi’s market. 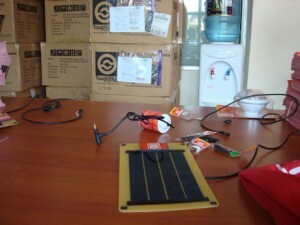 As you can see, the range of solar lighting and solar lanterns offers something for everyone. If you’re thinking of something solar for your household, that’s a great place to start your fact finding trip. Here, ToughStuff’s ecosystem of products built to work independently around a durable solar panel – available at Nakumatt – offers you flexibility in terms of whether you want only a lightweight portable mobile phone charging solution or if you’d prefer a light or both. 3. (Pay as you go) Mobile Business Models for Solar products: With Safaricom’s launch of the M-Kopa business model, customers now have the choice of paying for a solar product using M-Pesa over an extended period of time. The solar light is from d.light such as that available via Total. Their kit contains 3 bright lights and a mobile charging system, similar to the “Kit in a box” described above. The business model is designed to automatically deduct Kshs 40/= ($0.47) from your account in order to use the lights until the point where you own the system. 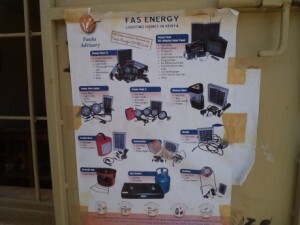 Alternatively, the complete kit can be obtained for Kshs. 15,000 ($175) upfront. Another is Eight19’s Indigo pay as you go solar that seems to be piloting in Kenya. Here they use vouchers or scratch cards to top up your charge rather than directly via the SIM card. This is however still in the pilot stage as the company websites do not yet show a Kenyan outlet. 4. Solar home systems (SHS): Known colloquially in upcountry locations as “sola”, the basic SHS consists of a solar panel, a battery for holding the charge, between 2 to 4 fixtures for holding energy saver bulbs (known informally as “solar lights”) and the requisite wiring. These kits can cost as little as Kshs 10,000 ($118) including installation and tend to be the starting point for many homes seeking modern energy systems. From here, one can build up to including inverters and larger panels such as the 100W-120W kits popular in Maasailand, that are able to power flat screen Sony Bravia televisions, kitchen appliances and the latest stereo systems in addition to lighting the home inside and out. Colour television and new digital systems require 60W at a minimum in order to work. Such panels alone cost around $200 upwards but prices are very rarely displayed and often negotiable. For a household in Nairobi, an SHS would be the first recommendation. Dayliff is probably one of the most credible brand names, as long as the technology is German. (Be sure to the check the back of the panel to ensure this). Ubbink is a newly launched brand that fundi’s consider to be efficient and high quality. It is manufactured by a Dutch company establishing Kenya’s first solar panel factory in Naivasha and their panels are smaller than average offering higher wattage and more affordable cost due to lack of import duties and transportation. Check them out. Its a commonly held fallacy that physical size of the panel is important. * Do find a reputable fundi with references and experience in calculating your power requirements and designing the requisite home system. This is the biggest reason for customer unhappiness with the performance of solar energy. * Don’t try to talk to all and sundry and make up a list of components yourself. This is another major reason for inadequate systems that fail to meet customer needs. * Do your homework, however. Nairobi’s CBD is the heart of the solar power industry for the entire country and the latest products are seen here first. * Don’t go window shopping without a list of minimum requirements on what you wish your SHS to be able to power and for how long. * Do have an idea of your estimated budget. For a 3-bedroom house in Nairobi, it’s possible to start as low as $500. * Don’t let the salesman confuse you until you simply give up and plunk down the money for the nearest panel. Take the time to think over what you really need to purchase. * Do keep in mind that SHS are modular and an experienced fundi can help you figure out your starter kit on which you can keep adding over time as budget permits. 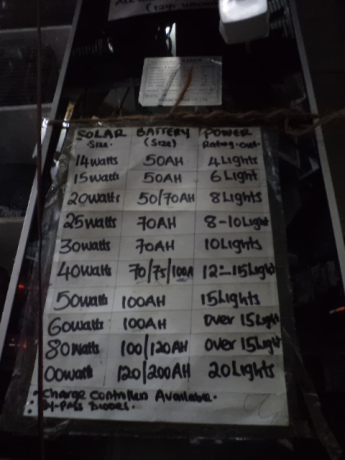 This entry was posted in IFC, KPLC, Safaricom, SME solutions, solar, Total and tagged solar on January 4, 2013 by bankelele. 2012 was expected to be an election year, which for Kenya are unfortunately marked by low economic growth, but this weekend, the electoral authority made an announcement that the next general elections would be held in March 2013. Since 1980, Kenya’s economy grew by an average of 3.4 percent. However, in election years, the average growth rate was only 2.4 percent, and growth was even below 2 percent in four of the election years. Equally challenging has been the management of post-election dynamics. Kenya achieved a modest 2.7 percent in post-election years, and three of the last six elections were followed by low-growth, especially in 2008, when post-election violence disrupted the country’s achievements of previous years. On to the index comparing prices of basic urban commodities to three months ago, a year ago and even four years ago when the country was still dealing with the disruptive after-effects of the controversial December 2007 election. Fuel: Petrol prices were reduced again last week to Kshs. 111.6 per litre (~$6.12/gallon) for Nairobi, down from Kshs 124 in December 2011. However a year ago the price was 98.8 (when the price control regime had just been introduced) and four years ago, after the election, a litre of petrol cost Kshs 87.9. Staple Food: A 2kg pack of (Unga) Maize flour, which is used to make Ugali that is eaten by a majority of Kenyans daily, costs Kshs. 97 down from Kshs 113 in December 2011. However last March it was Kshs. 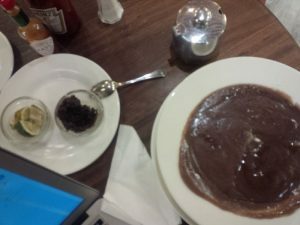 80 and four years ago (Feb. 2008) it cost Kshs 52. Other food item: Sugar: A 2 kg. 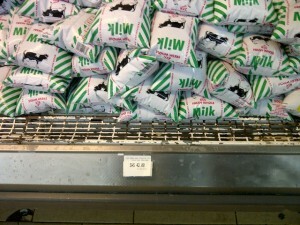 Mumias Sugar pack which was Kshs. 375 in December is now Kshs 245. 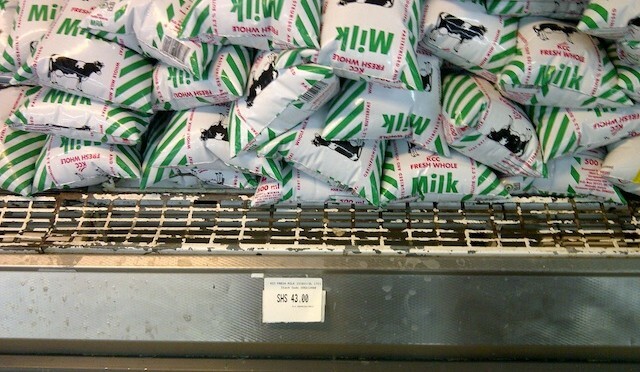 However a year ago it was Kshs 195, and other commodities normally bought alongside it (bread & milk) have had steady price rises this year. Foreign Exchange: 1 US$ equals Kshs. 83 compared to 84 in December 2011. This is exactly where it was last March 2011 before the Kenya shillings began a (now controversial) slide to Kshs 107 against the dollar. In February 2008, the dollar was exchanged at Kshs 70.7. Communications: Telephone call and data rates are largely unchanged, but Safaricom announced new rates for m-pesa including a slight increase for some transfers, but they also reduced the minimum amount that can be sent, opening the way to micro-payments. Meanwhile Airtel, who have set the low call regime over the last two years, appear to have reached an about-turn moment with their Chairman calling review of that strategy. Utilities: Pre-paid electricity is about Kshs 2,500 per month which is unchanged from the last review. I finally got a coherent explanation from a @KenyaPower employee on how you get hit with extra taxes if you buy more than a certain amount of Kwh units. LPG: Cooking gas supplies seem to have resumed stability for now, but at a price of about Kshs. 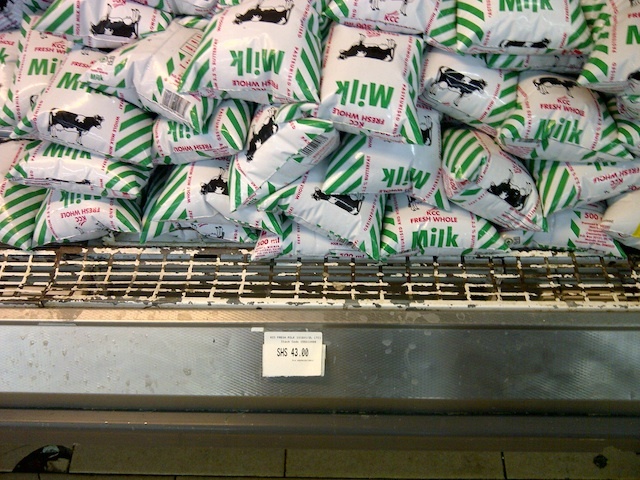 3,000 ($37) for a 13kg cylinder, up from less than Kshs. 2,500 before. Personally, I ditched my total LPG cylinder for a Kenol one as Total petrol stations never seem to stock enough for customers. Beer/Entertainment: A bottle of Tusker beer is Kshs 180 ($2.2) (at a local pub), unchanged from three months ago..but it was Kshs 120 in 2008. Generally prices have come down, but life is more expensive than what it was four years ago when the last election was concluded. However there could be some slight relief in slight for urbanites as the Kenya Cabinet approved the VAT bill 2012 which removed VAT from maize, wheat flour, milk, bread and medical supplies. This entry was posted in inflation trend in Kenya, Kenya economic growth, KPLC, Nairobi cost of living, Total on March 18, 2012 by bankelele.